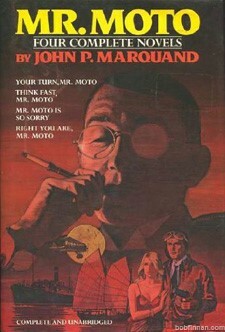 Fictional Japanese secret agent Mr. Moto was created by American author John P. Marquand. He appears in six novels published between 1935 & 1957. The character was initially created for the weekly magazine, The Saturday Evening Post, which was seeking stories with an Asian hero after the death of Charlie Chan's creator Earl Derr Biggers. In other media Mr. Moto has been portrayed as an international law enforcement agent. These include eight films released between 1937 & 1939 starring Peter Lorre, a 1951 23 episode radio show starring James Monks, a 1965 movie starring Henry Silva, and a 2003 comic book produced by Moonstone Books. Originally serialized in The Saturday Evening Post in 1935 under the title, ''No Hero''. (1936) - Originally serialized in The Saturday Evening Post in 1936. An expatriate American gets involved in intrigue in Peking when he tries to save an American woman from unscrupulous art dealers. Moto tries to save them both from a military takeover of Peking. (1937) - Originally serialized in The Saturday Evening Post in 1936. The heir to an American banking firm is sent to Honolulu to clear up a family matter involving a gambling house. Moto is also drawn to Hawaii to stop money being channeled into China to support revolutionaries. (1938) - Originally serialized in The Saturday Evening Post in 1938. An American on the run from authorities encounters Moto on a train journey through China. Moto is on his way to a life-or-death showdown with Russian spies and draws the hapless American into the situation when a secret message accidentally falls into the possession of a beautiful woman. (1942) - Originally serialized in ''Collier's Weekly'' in 1941 under the title ''Mercator Island''. After Pearl Harbour the character of Moto was "interned for the duration"
(aka ''Stopover: Tokyo'' and ''The Last of Mr. Moto'') (1957) - Originally serialized in The Saturday Evening Post in 1956 and 1957 under the title ''Rendezvous in Tokyo''. The original book was called ''Stopover: Tokyo'' and subsequent editions were called ''The Last of Mr. Moto'' and finally ''Right You Are, Mr. Moto''. 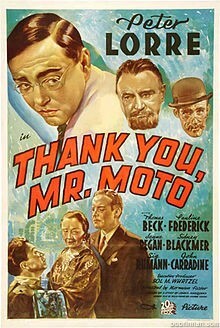 (1939) reprints Thank You, Mr. Moto; Think Fast, Mr. Moto; and Mr. Moto Is So Sorry. (1983) reprints Your Turn, Mr. Moto; Think Fast, Mr. Moto; Mr. Moto Is So Sorry; and Right You Are, Mr. Moto. Moto then notes that their steward Carson has an English flag tattoo. Bob and Moto become fast friends, as they learn that they were members of the same fraternity at Stanford University. The ship arrives in Honolulu, where Gloria Danton comes aboard and immediately attracts Bob's attention. The two fall in love, but Gloria warns Bob that he knows little about her. Moto finds Carson searching Bob's cabin and tells him that he recognizes the steward from the curio shop. The two men fight, and Moto throws Carson overboard. Arriving in Shanghai, Bob is distressed to learn that Gloria has left without him. When he gives Wilkie the important letter, the envelope is discovered to be empty. The two men call the elder Hitchings, who informs them that smugglers have been using their ships to bring contraband jewels and narcotics into the United States, and that the shipping line has already been fined $200,000 for this activity. Bob agrees to help Wilkie find the smugglers, but only after the two men search for Gloria. Meanwhile, Moto goes to the East India Bazaar where he meets Adram, who works for smuggler Nicolas Marloff. Adram immediately suspects Moto. That night, Bob receives a note telling him that Gloria works as an entertainer at the International Club. Wilkie warns Bob that the club is in a dangerous part of Shanghai, but the young Hitchings insists on going there. Moto and his female assistant, Lela Liu, also head for the club, but they are abducted along the way. Adram attempts to kill Moto, but instead is shot himself. At the club, Bob confronts Gloria backstage, and she confesses to really being Tanya, a White Russian emigrant employed by Marloff to discover Hitchings' plans. Marloff overhears her confession and takes them both as prisoners. Back at their table, Moto, Lela and Wilkie are greeted by Marloff, who offers to take Moto to his private gambling den. Moto tells Lela in Japanese to call the police for help, but she is shot by an unknown assailant just as she reaches the chief of police. Inside the gambling room, Moto tells Marloff that he is a smuggler, too, and suggests they join forces. Shown Marloff's prisoners, Moto suggests that Bob be ransomed and Gloria killed as a traitor. Wilkie enters the room and demands that Bob be released. The wounded Adram then arrives and identifies Moto as a police informant. As Moto tries to shoot Adram, Wilkie interferes, and Moto is shot instead. Just as Marloff is about to finish Moto off, the police arrive, and Moto shoots Adram dead. As Wilkie reaches for Marloff's gun, it discharges and kills Marloff. Moto then arrests Wilkie as the leader of the smugglers, as he killed Marloff to keep from being identified. When Moto is informed that Lela has been wounded, he finds the "smoking gun" on Wilkie. With the case solved, Moto tells all that he is actually the owner of the Dai Nippon Trading Company, the Hitchings' best customer, and a "sometime amateur detective." Bob and Moto then share a fraternal handshake as Gloria looks on. In the Great Gobi Desert, a Mongolian named Ning attempts to murder a man in his sleep who recently joined his camel caravan, but the man instead kills Ning. At Peiping, when an ancient scroll is found by police hidden in the man's staff, he escapes to the Grand Hotel where he changes clothes and reveals himself to be Mr. Moto, known as a mysterious adventurer, explorer and soldier of fortune. Moto attends a party given by Colonel Tchernov in honor of Eleanor Joyce, the daughter of a famous importer. After Prince Chung refuses to sell Colonel Tchernov a set of scroll paintings from the Yu'an Dynasty, Tchernov pulls a gun on him. Eleanor sees the prince angrily leave with his mother, Madame Chung, and then finds Tchernov dead. When Moto arranges the death to look like a suicide, Eleanor objects but he warns her that the incident could provoke an international incident. At Chung's home, the prince thanks Moto for saving his life, as Tchernov was about to shoot the prince, when Moto entered and then killed Tchernov with a knife. In gratitude, the prince shows Moto the scrolls, which one of his ancestors painted. If placed in the proper order, the seven original scrolls, five of which the prince has, reveal a map to a great treasure in the hidden tomb of Ghengis Khan. The prince says that a sixth scroll is hidden in the Gobi desert, while the last has recently disappeared from a museum where the Chungs lent it for exhibition. After Moto reveals that he was sent to recover the treasure, Madame Chung rebukes her son for showing the scrolls and explains that it is their duty to see that the tomb is not despoiled. When Moto accuses an antique dealer, Pieriera, of stealing the scroll from the museum, Pieriera is about to name the man who paid him when he is shot from a passing car. In Moto's hotel room, he finds his belongings rifled, and when he perceives that the would-be thief is hiding, he places a gun loaded with blanks on a counter for the thief to find. He then takes out his scroll, which the thief, Schneider, steals after shooting Moto with the gun. Moto pretends to die, but then follows Schneider to the Tchernov home, where Eleanor, who is suspicious of Moto, is staying. Eleanor observes Madame Tchernov remove a scroll from her safe and leave with Schneider after speaking on the telephone with someone she calls "darling." Moto then reveals to Eleanor that he is really a detective for an importers' association. He traces the call to the Chung house and prepares to go there, but he is knocked out by the Tchernov butler Ivan. Schneider and his cohort, Eric Koerger, try to torture the prince, who refuses to reveal the hiding place of the scrolls. However, when they strike Madame Chung, the prince succumbs and the scrolls are found. Ashamed of her son, Madame Chung tries to attack the thieves with a dagger, but Koerger shoots and kills her. The thieves, having now obtained all seven scrolls, leave and take Eleanor hostage before Moto arrives with Tom Nelson, a member of the American Legation who has been courting Eleanor. After the prince, believing that he has shamed his ancestors, commits hara-kiri, Moto pledges that no one shall desecrate the tomb. He and Tom follow the thieves to a river where aboard a junk, Moto reveals that the scroll stolen from his room is an imitation. With Eleanor's help, he convinces Madame Tchernov that Koerger planned to get rid of her in favor of Eleanor. A fight breaks out during which Schneider and Koerger are killed. Moto then burns the scrolls thus keeping his promise to Prince Chung, whom, he says, can now face his ancestors without shame. At the end of one of detective Mr. Moto's classes in criminology, student Lee Chan, the son of the famous Honolulu detective Charlie Chan, notices that his watch has been stolen. Horace "Knockout" Wellington, another student, confesses that he is the culprit and reveals, to the mirth of all, that he cannot help taking things that attract his eye and later cannot remember where he purloined the objects. 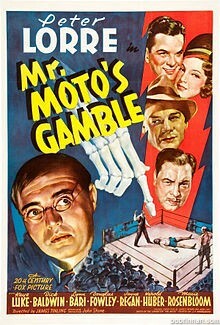 Moto invites Lee to accompany him and Lieutenant Riggs to a boxing match between Bill Steele and Frankie Stanton to decide who will fight world champion Biff Moran eight weeks later. Before the fight, gambler Nick Crowder bets $10,000 with bookie Clipper McCoy that Stanton will not last until the fifth round. Because he has already taken similar bets from gamblers in six other cities, Clipper warns Stanton's manager, Jerry Connors, that Stanton better not throw the fight. Riggs, Moto and Lee sit with Philip Benton, whose company owns the arena, and Benton's snooty daughter Linda, who is interested in Bill even though he likes sports reporter Penny Kendall. After Stanton's eye is cut, the referee threatens to stop the fight. Connors applies collodion to close the wound, and in the next round, Bill knocks Stanton out. When the doctor pronounces Stanton dead, Moto recovers a dried bit of collodion. Connors, who threw the bottle he used out a window, gives Moto another bottle to examine. Benton, who earlier told Riggs that he never bets, calls Clipper, who has lost $130,000 on the fight, to say that he will send a check for $10,000 to cover his bet. The poison that killed Stanton is found on Bill's gloves, and he is charged with manslaughter and suspended by the boxing commission. Although Penny convinces her editor to put up the bond money, she finds Bill leaving jail with Linda, who has already paid with a check from her father. When Moto proves to his class that the poison was shot onto Bill's glove from someone outside the ring, Lee and Wellington leave to investigate. Moto finds that Wellington has taken his overcoat and left one he earlier took from the arena, which has a stain on the inside that matches the stain found on Bill's glove. Meanwhile, at Moran's training camp, Benton and press agent Gabby Marden overhear Clipper accuse Nick of placing bets in other cities to keep the odds up at the fight. As Gabby goes to call Riggs with the information, someone takes a shot at him. After Riggs and Moto find that the owner of the overcoat, John Howard, has died from the same poison that killed Stanton, Moto, believing that Howard was a fall guy, convinces the boxing commission to lift its suspension of Bill and promises to have the murderer arrested at ringside the night of Bill's fight with Moran. In his room, Moto is confronted with an armed man, but Moto's cat Lena knocks over a vase, which allows Moto to grab the gun before the intruder escapes. At the vacant arena, a mysterious figure places a gun attached to a clock under the ring, and aims it at Moto's seat. Before the fight, Penny kisses Bill and wishes him well and then berates Linda for only caring for a winner. With the gun pointed at him, Moto surveys his suspects as the fight proceeds. He then invites Linda to sit in his seat, and after Bill knocks out Moran, Moto announces that he will shortly produce Stanton's murderer. When he insists, despite Benton's attempt to get his daughter away, that Linda remain in the seat, Benton rushes to the ring and disconnects the gun before it fires. Moto explains that he investigated the arena before the fight, because he knew that the murderer would try to kill him to keep him from revealing his identity, and he took the bullets out of the gun. As Penny hugs Linda, Benton dashes to his office, where Clipper shoots and kills him for arranging the bets on Stanton from the other cities. The police then capture Clipper as Lee and Wellington arrive, having discovered the murder weapon, a water gun filled with poison. Back in his classroom, Moto explains why he suspected Benton and, as he goes to leave, discovers his timepiece missing. Wellington returns it, and Moto reveals that he now has Wellington's wallet, which, it turns out, Wellington stole from Lee. When globe hopping aviatrix Victoria Mason reaches the small kingdom of Tong Moi, above Siam, she throws a flare into the rear of her plane and parachutes to safety before the plane crashes in flames. The crash is seen by Moto, leading an archaeological dig, and by American newsreel cameramen Marty Weston and Chick Davis. After Moto helps Vicky, he sends a note about her arrival via carrier pigeon. Vicky is presented to ruler Rajah Ali, who insists above the objections of his high priest Bokor that she stay as his guest. As Marty and Chick shoot footage of them, Bokor objects that this displeases the gods. However, the ruler states that the cinema is not dangerous, and filming proceeds until Keema, his favorite wife, falls dead. While Marty and Chick are taken by Bokor to a hidden temple for a trial before the gods, Moto discovers that a poison dart from a blowgun killed Keema. Deemed guilty, Marty and Chick are about to be thrown into a well, when a fire erupts and an old guru, on a pilgrimage from the Himalayas, emerges from the temple. After he proves his powers to Bokor, he orders the men freed. The next day, in the cave of the temple, the guru discovers cans of explosives in a secret room below. After he subdues one of Bokor's men, the guru removes his mask and reveals himself to be Moto. He then sends a message by pigeon, stating that he has located the munitions base and that Bokor is the leader of the revolt. However, Rajah Ali shoots down the pigeon and, at a celebration that night, serves it to Moto. When Vicky graciously agrees to become the rajah's next wife in his harem, Marty, who is attracted to her, prepares to leave. After Vicky finds information that Moto is a spy and locates his map of the temple, she heads there followed by Bokor. Convinced by Chick that she is in danger, Marty hastens there also, but he is captured along with Vicky. After Zimmerman, the munitions dealer, arrives and captures Chick, Bokor has Zimmerman killed. He then proclaims that his revolt has begun and will not end until every foreigner is driven from Asia. Moto, who has emerged again as the guru, attempts to deflect Bokor's bloodlust, but when Chick is about to be executed, Vicky reveals Moto's identity and, in the confusion that follows, a fight breaks out. With the munitions, Moto and Vicky, who is working for British Intelligence, fight alongside Marty and Chick to stave off Bokor's men. As they run out of ammunition, Rajah Ali arrives with troops and captures Bokor and his followers. When he says that he will execute Moto, Vicky, Marty and Chick, Moto threatens to blow them all up by dropping a torch into the room with the explosives. Marty throws a gun at Rajah Ali, who falls into the room. Moto then lights a fuse of film that he rigged up leading to the explosives, and after they escape, the temple explodes. Disguised as Japanese murderer Ito Matsuka, Mr. Moto, an agent of the International Police, leads Paul Brissac, a Frenchman, in an escape from Devil's Island. In London, Moto becomes a houseboy for Brissac, a member of a group of hired killers of diplomats and economic leaders, which the newspapers have dubbed "The League of Assassins." Moto is trying to learn the identity of the group's leader and the reason that they are in London. Meanwhile, Prague steel king Anton Darvak, a pacifist, has refused to sell to armament manufacturers a formula for a new type of steel. After he receives a threatening telephone call at his London hotel, Moto learns of the call from one of his agents, Lotus Liu. On his way to visit Darvak, Moto witnesses a lorry back up and kill a man in a street market. Darvak at first refuses to tell Moto about the threat against his life, despite the urging of his secretary, Ann Richman, and his business associate, David Scott-Frensham. However, when he learns that the man run down by the lorry, Lord Gilford, was killed as a warning to him, Darvak confides to Moto that he was told he would be killed the next afternoon at three if he does not part with the formula. Moto visits the Limehouse tavern where Lotus lives. After he hears the accordion player play the same tune that an organ grinder played before Lord Gilford was killed, a brawl begins. Moto takes Lotus to her room to pack, and they find the body of a member of the league, who was killed because he confided in Lotus. At Brissac's residence, Ernst Litmar tells Brissac that Moto was seen in the bar speaking with Lotus. They send Moto to a certain store for fruit, and when Moto gets there, he hears a street violinist play the tune he heard before the two previous murders. A number of toughs crowd around him, but he escapes in a cab. The next day, Moto goes to Coventry Galleries, knowing that Darvak plans to be there that afternoon at three to see an exhibition. He overhears Litmar explain to Brissac the plan to kill Darvak: the leader of the group will position Darvak in front of a particular painting and say his name in a loud voice; the orchestra will then play the same tune used previously to identify men to be murdered; Brissac, in the gallery loft, will cut the chandelier, and its fall will kill Darvak. After Ann tells a surprised, but very pleased Darvak that she loves him, Moto visits. David also arrives and says that he has brought two men from Scotland Yard to protect Darvak. When Moto is stopped by the two plainclothesmen in the hall, he sees that one of them has a gun and knocks them over a bannister. As three o'clock nears, David arrives alone at the gallery, and as he stands in front of the painting, an eccentric German artist complains about the art exhibited. When Darvak arrives with the plainclothesmen, the crank artist loudly calls David "Darvak," and the orchestra plays the tune. Brissac cuts the chandelier, and it kills David. The crank artist then removes his disguise and reveals himself to be Moto. He explains he knew that the leader must be David because the plainclothesmen had guns, while Scotland Yard officers do not carry any. As the gang is apprehended, Brissac shoots from the loft, but Moto fights and subdues him. Fabian, the leader of a spy ring, plots to disrupt the peaceful relations between England and France by blowing up the French fleet as it steams through Port Said in the Suez Canal. Although Fabian is posing as a ventriloquist to hide his sinister activities, British agent Burke has infiltrated the ring under the alias of Danforth, and has warned the French of imminent danger. Consequently, the arrival of the fleet has been delayed. Meanwhile, Mr. Moto, an agent of the International Police who is masquerading as an antique dealer, is also trying to uncover Fabian's plot. After ordering Eric Norvel, one of his men, to trick the admiral's wife, Madame Delacour, into revealing the arrival date of the fleet, Fabian discovers that Danforth is a British agent, then disposes of him by cutting Danforth's lifeline on the diving bell into which he is submerged near the site of the explosives. Thus Fabian cleverly makes it seem as if the British are responsible for the sabotage. Becoming suspicious of the antique dealer, Fabian orders his girl friend, Connie Porter, to follow him. Connie's report confirms Fabian's suspicions that the antique dealer is Mr. Moto, and Fabian orders that he be killed, but Moto cleverly escapes. As the fleet steams into port, Fabian readies to give Norvel the signal to detonate the explosives, but Moto intercepts Norvel and sets off the explosives before the fleet can reach port. Fabian then tries to kill Moto himself, but his attempt is cut short when Connie, who has discovered his treachery, shoots him. Mr. Moto, accompanied by Twister McGuirk, a wrestler who has apprenticed himself to the famous detective in order to learn his jiu jitsu tricks, arrives in Puerto Rico on the trail of a diamond smuggling ring. After the murder of a secret agent, Moto follows a trail of clues that leads him to a sinister swamp, a reputed haunting grounds for ghosts. When the governor of the island is slain in the same manner as the agent, Moto and Twister return to the swamp, where they are captured by the smugglers, who have appropriated the pond as their hideout. 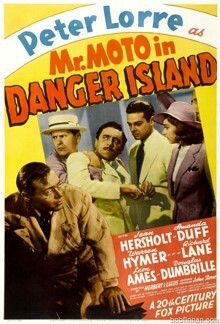 While a prisoner, Moto discovers that the diamonds are being smuggled inside of coconuts, and after accumulating enough evidence to indict the smugglers, the detective and his apprentice escape to the mainland. Moto returns to the smugglers' hideout, accompanied by the police and Sutter, the head of the diamond dealers, but they arrive just in time to see the head of the ring speed away in his boat. Sutter takes aim and shoots the criminal, and the wounded man is taken to the hospital. That night, an attempt is made on the man's life, but Moto emerges from the shadows just in time to unmask the murderer as Sutter, the real head of the smugglers. After explaining that Sutter had planned to prevent the wounded man from exposing the diamond dealer as the real criminal, Moto reveals that Sutter's bullet had really killed the smuggler in his attempted escape from the swamp, and that the sly detective had used the dead man's corpse to bait a trap for the real crime boss. Hoping to unmask the psychotic jewel thief known as Metaxa, detective Mr. Moto follows archaeologist Howard Stevens, who has just discovered the crown of the Queen of Sheba, on his voyage home from Egypt to San Francisco. 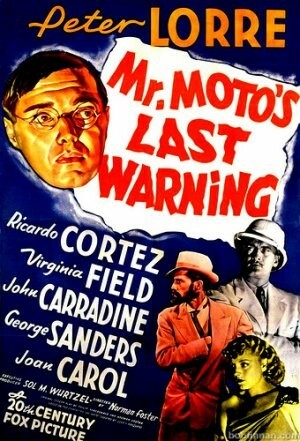 Moto's cover as a Japanese tourist is blown when he meets his old friend, amateur detective Archie Featherstone, whom he introduces to the Stevens and fellow passenger, Eleanor Kirke. Meanwhile, in San Francisco, jewel thieves Joe Rubla and David Perez make plans to steal the crown, but decide that they must also eliminate Moto. Upon docking in San Francisco, Stevens is met by Hendrik Manderson, the philanthropist who has financed the expedition, and Fremont museum curator Professor Hildebrand and his secretary, Susan French. As Wendling, a member of Perez' gang, follows Moto in a cab, Joe tries to steal the armored car in which the jewels are housed, but he is foiled by the police and Archie, then escapes. The next day, the crowd reconvenes at the museum for the unveiling of the crown. Archie, who has witnessed the armored car robbery, is trailed by Perez, who deliberately breaks Archie's camera in order to lure him into a death trap later that night. Back at his hotel, Moto receives an urgent call from Manderson's servant Wong, who asks the detective to meet him at a Chinatown restaurant called the Laughing Buddha. When Moto arrives at the restaurant, however, he discovers that Wong has been murdered. Archie, who is also in Chinatown, tells Moto of his plan to meet Perez later that night, but Moto, recognizing the meeting as a set-up, convinces him not to go. Instead, the pair drive to the museum, where they find Hildebrand and Manderson playing chess and the phone and alarm dead. Paul Borodoff, the insurance company investigator, then appears and tries to steal the crown for himself, but he is stopped by Mr. Moto who announces that Metaxa is in the room. Just after Moto accuses Hildebrand of being Metaxa, Rubla tries to steal the jewels, but he is arrested by the police. Moto then unmasks Manderson as the real Metaxa when he attempts to steal the crown. Mr. Moto, an INTERPOL agent, investigates a sabotage plot at the Beta Oil Company in London after Dargo, a ruthless ex-Nazi, and his gunman Hovath kill McAllister, an executive of Beta Oil, at the onset of an important oil conference held at British intelligence agent Jonathan Westering's estate. Dargo discovers the INTERPOL agent's interference, throws him into the river, and acclaims Mr. Moto's death. At the meeting, David Lennox, head of Beta Oil, persuades the Shahrdar of Wadi Shamar to renew Middle East oil concessions to the British firm. Mr. Moto, disguised as a Japanese oil magnate, learns that McAllister may have tried to turn over the Beta concessions to an underground syndicate forming an oil trust along the Persian Gulf as a step toward world control. Dargo and Hovath kidnap Maxine Powell, Lennox' secretary, and hold her hostage at a nightclub to extract company secrets from her. Mr. Moto follows them to the nightclub; a gun battle ensues; and Moto kills Dargo, arrests syndicate members Westering and Wasir Hussein, adviser to the Shahrdar, and rescues Maxine. From May to October 1951, the NBC Broadcasting network produced and aired 23 half-hour episodes starring James Monk as Mr. I.A. Moto, International Secret Agent. Mr. Moto is an American of Japanese descent born in San Francisco but retaining his international connections. The show focused on Mr. Moto's fight against Communism although occasionally he solved more mundane mysteries such as murder and blackmail. 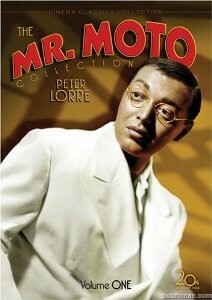 Peter Lorre brought the character of Mr. Moto to many comedy radio programs. Camel Caravan Oct. 24, 1938 on CBS. Eddie Cantor, host. 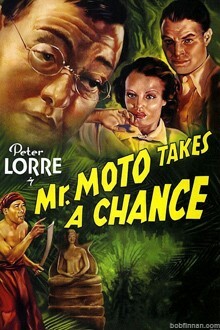 Peter Lorre as Mr. Moto investigates the disappearance of guest Martha Raye. Royal Gelatin Hour Aug. 10, 1939 on NBC. Rudy Vallee, host. 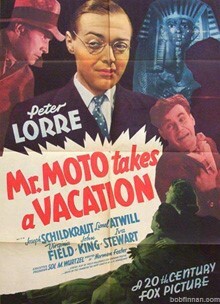 Peter Lorre as Mr. Moto in a mystery sketch. George Jessel's Celebrity Program Aug. 16, 1939 on NBC. George Jessel, host. 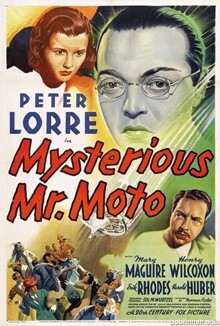 Peter Lorre as Mr. Moto in a mystery sketch. Texaco Star Theater Oct. 4, 1939 on CBS. Ken Murray, host. 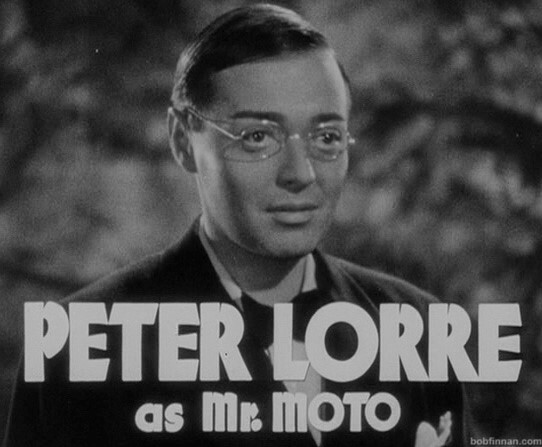 Peter Lorre as Mr. Moto in a mystery sketch. Texaco Star Theater Jan. 3, 1943 on CBS. Fred Allen, host. Peter Lorre as Mr. Moto in "The Missing Shot or Who Killed Balsam Beamish?" Mr. Moto vs. One Long Pan. Texaco Star Theater June 4, 1944 on CBS. Fred Allen, host. 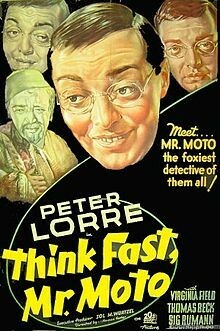 Peter Lorre as Mr. Moto in "More Murder on the Fred Allen Program." 'Porky's Movie Mystery' (1939) Warner Brothers cartoon featuring Porky Pig as the detective "Mr. Motto." 'Java Jive' (1940), a song by lyricist Milton Drake and musician Ben Oatlands that was recorded by the Ink Spots, makes whimsical mention of the detective in lyrics loaded with period slang. A new web series titled, "MS. MOTO". on youtube. During the golden age of magazine fiction, motion pictures, and radio-roughly the 1920s through the late 1940s-three Oriental crime fighters were introduced to the American public. Through the media which they inhabited they became fictional icons in American popular culture: Honolulu Police Inspector Charlie Chan, International Secret Agent Mr. I. 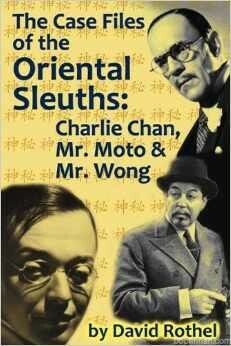 A. Moto, and Justice Department Agent Mr. James Lee Wong-commonly known as the Oriental Sleuths. Created by respected authors Earl Derr Biggers, Pulitzer Prize-winner John P. Marquand, and Hugh Wiley, the three sleuths' adventures first appeared in popular magazines and then were quickly snapped up by Hollywood to sate the appetites of film-goers for detective thrillers on the silver screen. Charlie Chan carried his case loads over into radio, television, newspaper comic strips, comic books, Better Little Books, and games. Mr. Moto followed with radio adventures and a graphic novel, and Mr. Wong added comic book exploits to his résumé. Now author David Rothel brings all three Oriental sleuths together for the first time in one volume as he examines their origins and covers their development in all the media forms they encompassed through the years. This book was written to fill a void-a reference bible for Mr. Moto film lovers everywhere. 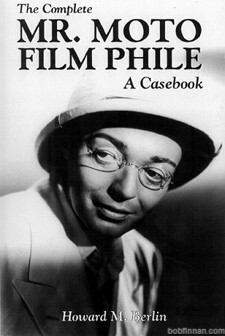 The Complete Mr. Moto Film Phile: A Casebook is the culmination of Howard M. Berlin's ground-breaking film research. and the third contains several important appendices, essential both to researchers and readers. Most of the novels are about intrigue in Pacific Rim countries in the 1930s. The central character is usually an American, a military veteran, who becomes accidentally enmeshed in the action and meets Moto. 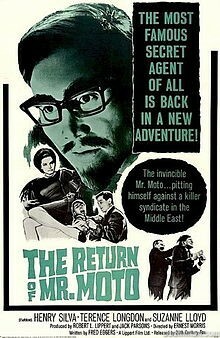 The ex-military American character usually does not realize that Mr. Moto is an imperial agent until late in the story. Mr. Moto is a master at working under cover. Though capable of ruthlessness and deadly violence, he appears to be merely a harmless, easygoing eccentric. Through a series of fast-paced adventures, the characters gradually comprehend how important and formidable Moto really is. Marquand tends to keep Mr. Moto in the background rather than at the center of the action, with the spy's more dramatic exploits typically described second-hand. It lends a further air of mystery to the character.